Wes Glebe has been making jewelry in many and varied forms for most of his life. At about the age of 11 he found a chunk of bronze and spent days drilling, filing and grinding it. Somehow he had obtained a small sterling eagle from a military ornament and soldered it to the top of the ring, and that was how his first ring happened. Fifth grade was the start of his exploration of leatherwork, which then merged into tool making since he didn't have money to buy tools. His 7th grade wood shop teacher was the son of a German jeweler and they spent many wonderful hours after school learning basic casting techniques. Since then there's hardly been a day when he hasn't been making something. High school was a time of intense exploration and prolific production. During his first year at University he made a new piece of jewelry every day for his future wife. When he applied to the Peace Corps he was asked to join as a handicrafts adviser and spent 2 years making and designing things out of indigenous materials, including the house in which he lived, and a boat. Wes' background in art has instilled in him the awareness that any object can become ornament or adornment. It doesn't have to be "precious" in order to be part of his personal language. His reason for using titanium is not for its high-fashion aspect but because it is an exciting material to be the carrier for the 24k gold he uses. 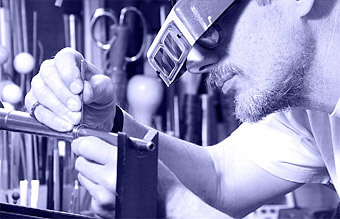 His current line has the imposition of some traditional joining processes, only using cold connections such as riveting and wrapping. This appeals to the designer and engineer in him because it forces him to come up with solutions to design dilemmas that are not the usual or obvious ones. Christine Bailey, Wes' wife, comes from Norfolk in England. She has been in the US since 1969. In 1970 Christine started taking jewelry-making in adult education classes at Penn State and eventually had her own jewelry business for 12 years. This has given her the ability to discuss, understand and appreciate the work that Wes does. Her major contribution is that of computer-guru in the day-to-day maintenance of the web-site and taking care of the many tasks associated with running a small business today. She is usually the contact-person with customers through e-mails. Christine worked in Rare Books and Special Collections in the Pennsylvania State University Libraries from where she retired in 2006. She was fortunate enough, when she applied for part-time work in the library, to be offered a job in Rare Books where she worked for almost 35 years, the later years being full-time. Her mentor was the late Charles Mann who started Penn State's Rare Books Collection in the 1950's. His love of books was apparent to all who interacted with him and it didn't matter whether he was speaking to a new student or an emeritus professor, he was just as delighted to speak about the treasures in his charge. Charley's ability to inspire and teach found fertile ground in Christine who really loved working with these, in many cases, old and rare books and manuscripts. The look, feel and even the smell of books is something that can never be eclipsed by computers. The retirement party that was organized by Christine's library colleagues (with not a little help from Wes) was outstanding! It was a wonderful and overwhelming occasion with beautiful food, many kind words and thoughtful gifts. Wes gave her the first of a new series of Blue and White rings, with a band of sapphires and diamonds.